".....neoconservative optimism about the prospects for global social engineering seemed to have triumphed any doubts that arose from that domestic skepticism." The writer uses Thomas Sowell's theory of "constrained" (conservative) and "unconstrained" (left liberal) vision to show how the Bush administration has pretty much adopted the latter worldview. Not only in its approach to Iraq but in the domestic social programmes it is running. Sowell's constrained vision in its purer forms is probably a shade too constrained, too ready to assume that old customs continue to serve their traditional functions under changed circumstances. But it is the worst features of the unconstrained vision—its hubris, its pretense to omnicompetence—that have taken hold of the right. And if there is wisdom in each of the two perspectives, it should be worrying that, for all the other differences between the major parties, between progressives and conservatives, in this one fundamental way the political landscape increasingly offers only half the picture—different refractions of the same unconstrained vision. With the waning of the constrained perspective's tempering influence, we're left with a political vision that's dangerously double. Precisely. I suspect over the coming years, throughout the developed world, the only choice we will have is between big government and bigger. (A) survey found that single women have significantly lower incomes than men or married women, feel uninformed about politics, and doubt that their votes make a difference. Two-thirds of the women polled disapprove of President Bush, and the Iraq war, health care and the economy are their top concerns. Avis Jones-DeWeever, of the Institute for Women’s Policy Research, said, “Unmarried women don’t vote because the government doesn’t pay attention to them,” reports the San Jose Mercury News. Gee. I wish the government would pay less attention to me. I wish the government would pay less attention to all of us, so we can live our lives. Maybe we all shouldn't vote. The ODT and DomPost are running stories today about our failing prison system. • Prison work has been cut officially from 43% to 35% of prisoners in the past three years, and only 19% are actually employed by the prisons’ business unit. The others have only part-time work, such as cleaning their cell blocks or serving the meals. • Education has been massively disrupted by overcrowding and resulting frequent transfers of prisoners when beds become available around the country. The prison education budget was underspent by 44% last year and training is forecast to be underachieved again by 33% in 2005-06. • Many prisons lack proper libraries and rely on donations of old books from the public or from public libraries. • Several prisons, including Mt Eden, Wanganui and Wellington, do not have gyms. • A new booking system for prison visits, combined with a doubling of prisoner transfers has cut visitor numbers, weakening prisoners’ links with family members who might motivate them to reform their lives. The crowding in jails has seen evening lock-up time brought back from 8.30pm to 5pm in many of the country’s 19 prisons, because guard numbers have not kept up with an unpredicted increase of almost 2000 extra prisoners since the Sentencing and Parole Acts were tightened in 2002. This is terrible. Prisons without gyms. Around 80% (of prisoners) reoffend soon after release. That is up from approximately 45% when I started law practice over 30 years ago. Back then the idealists were claiming that prison didn't work. They used it to justify the loopy experiment we've been running for the last 30 years, hoping that if we are all nice enough for long enough to criminals they might decide to be nice back. It's been a complete failure. Under the legal system we inherited from Britain, the State claimed the victim's right to retribution. "Leave it to us" worked for hundreds of years. Then the anointed in charge reneged on the bargain. They shudder at what they call "vengeance". ACT does not. ACT shudders at the harm to the innocent since Sir Geoffrey Palmer's announcement 16 years ago that retribution had no place in the law of a civilised nation. We think the price for that political correctness is paid by the 45,000 bashed, robbed, raped or murdered last year, nearly 5000 per year more than when Helen Clark took over in 1999. Being confined to their cells, they are restricted in what they can do. It’s turning them into vegetables, said the society’s secretary, John Whitty. Howard League president Peter Williams said some young people would be psychologically harmed by being cooped up so long in cells which are about 3m square just big enough for a bed, a small desk on one wall and a stainless steel toilet with an attached hand basin on the pipe behind the toilet bowl. In some older prisons, such as New Plymouth, Prison Chaplaincy Service manager David Connor said some cells are so small that you can stand in the cell and touch the two walls. These same people champion the welfare system that produces many of our criminals. The only progress we can make is reform both systems. And I don't mean make them more generous. If we aren't tougher, as a society, we are going to keep on paying the rising social costs. Perhaps we just don't grasp what these costs are until personally affected. Then it is too late. For what was New Zealand ranked third in 2004, sixth in 2005 and ninth in 2006? Figures released under the Official Information Act show that 45,643 single parents with children aged 5 to 18 do not have even a part-time job. Some of these parents will have genuine reasons for being unable to work. Around 4,000 are on a sickness or invalid benefit. Some may be involved in volunteering. But there is clearly a significant resource being wasted at a time when government has stated a clear priority to raise productivity. At May 2004 37,000 single parents on the DPB had school-age children only but no other source of income. If the Ministry's figures are accurate, there is an increasing trend for single parents to stay on a benefit even after their kids start going to school. The Chief Executive of the Ministry of Social Development and Employment, Peter Hughes, said in the letter containing these figures,"In many cases, (single parent's) social and environmental circumstances mean that seeking employment at this stage of their lives is not appropriate." There is that word again. I guess it is appropriate for you to go to work so these people can stay at home. The significant rise in public spending by the United States government seems to suggest that the party supposedly in favour of limited government, the Republican Party, now believes that big government is good government; as long as they are the ones governing. Federal spending is up eight percent since 2005, and 33 percent since 2001. The government spends more today per household than it has since the end of World War Two. Closer to home, government spending continues with the roll-out of the Working for Families package. While the National Party continue to criticise administrative blunders, they have not articulately critiqued the assumptions regarding the legitimate role of government that underlie the package. The question of legitimacy is all important when it concerns the use of power. Like the big-spending Republicans, all political parties make different assumptions about the value and nature of human freedom, and consequently, the degree to which government power should be both enforced and restrained in order to protect it. People are different and when free people act, they will experience different outcomes. This is why there is always a trade-off between freedom and equality which is usually paid for at the other's expense. Two assumptions embedded in the extended Working for Families package are that take-home incomes should be subsidised in the interests of equality rather than need, and that it is a legitimate role of government to mitigate the outcomes of each individual's unique decisions. Raising a family is costly and couples who make that choice should be applauded and supported by the community which benefits from that decision. Thankfully, this is happening in New Zealand. Those tax-payers without dependent children already support families to a significant extent through the public provision of education and subsidised health-care. Society also provides a welfare safety-net for those in genuine need, but whether welfare should extend to income redistribution is an entirely different matter. If we accept the assumption that the government is justified in using power to arbitrarily equalise incomes, what is left to restrain it from redistributing and spending further? It is often said that oppositions have principles and governments have programmes. Sadly one assumption which eventually finds its way into nearly every cabinet room is that big government is good government as long as it is ours. A travelling salesman was passing through a small town in the West when he saw a little old man sitting in a rocking chair on the stoop of his house. The little old man looked so contented that the salesman couldn't resist going over and talking to him. "You seem without a care in the world," the salesman told him, "What is your formula for a long and happy life?" "Well," replied the little old man, "I smoke six packs of cigarettes a day, I drink a quart of bourbon every four hours and six cases of beer a week. I never wash and I go out every night." "My goodness," exclaimed the salesman, "that's fantastic! How old are you?" Sen. Hillary Rodham Clinton slammed private-school voucher proposals yesterday, predicting that vouchers would eventually lead to the creation of taxpayer-financed white supremacist academies - or even a government-funded "School of the Jihad." Clinton, a longtime voucher foe who earned the backing of the city teachers union in 2000, says government financing of sectarian groups would incite ethnic and religious conflict - and encourage fringe groups to demand government cash to run their schools. "First family that comes and says 'I want to send my daughter to St. Peter's Roman Catholic School' and you say 'Great, wonderful school, here's your voucher,'" Clinton said. "Next parent that comes and says, 'I want to send my child to the school of the Church of the White Supremacist ...' The parent says, 'The way that I read Genesis, Cain was marked, therefore I believe in white supremacy. ... You gave it to a Catholic parent, you gave it to a Jewish parent, under the Constitution, you can't discriminate against me.'" As an adoring, if somewhat puzzled, audience of Bronx activists looked on, Clinton added, "So what if the next parent comes and says, 'I want to send my child to the School of the Jihad? ... I won't stand for it." The former first lady said that vouchers would also accentuate divisions, singling out government-financed Protestant and Catholic schools in Northern Ireland and similar arrangements in the Netherlands as examples of poorly functioning systems. She spoke during a breakfast at the South Bronx Overall Economic Development Corp., where she denounced Bush administration cuts to community development programs, offered advice to minority and women business owners and vowed to help bring more broadband access to the South Bronx. Andrew Coulson, who works on education issues for the conservative Cato Institute, differed on the voucher issue, saying, "It's misleading because under federal law no one would be permitted to open a school that advocates violence against the country." At last, a good use for a much over-used word. It is somehow fitting that one of Parliament's least effective MPs, NZ First's Barbara Stewart, should have a bill to reduce the number of MPs from 121 to 100 pulled from the ballot box. In fact, this is probably the most useful thing she has done in the three and a half years she's been there. South Dakota is moving closer to passing legislation that will virtually ban abortions. In nearly all cases abortion would become a felony carrying a five year prison sentence or an $8,000 fine on doctors or others who perform them. Bans do not work. Not only do they fail to control the 'undesirable' activity, they produce other negative effects. As stated yesterday, 45 percent of births are now ex-nuptial. Part of the reason ex-nuptial births have risen so sharply is the rise in de facto relationships. A commentor asks, what is the percentage of children born outside a marriage or a committed non-marriage? I'm not aware of any data that conclusively answers that question. But I'll have an unscientific go. A NZ study looked at children born in 1993 who had been on a main benefit by age seven. There were 58,866 registered births that year. Sixty percent of the children born had contact with the benefit system by age 7. Of those, the study estimated 40.8 percent were included on a benefit at birth. That's 14,410. By age two the percentage of all children born in 1993 that had been on a main benefit was 45 percent or 26,489. Sixty two percent of these children had a single care-giver. That's 16,423. I would suggest that there were at least this number of children born outside of a marriage or committed de facto relationship (one that endures beyond 2-3 years) in 1993. Children born in the same circumstances who didn't go on a benefit are ommitted. The number won't be very high and could be offset by those children in the statistics whose caregiver is on a widow's benefit. So I estimate that at least 28 percent of children born in 1993 were born outside of a marriage or committed relationship. Given DPB numbers now are higher and total births slightly lower I don't think my estimate will have decreased. From Anthony B. Bradley of the Acton Institute, a conservative, religious US think-tank comes this piece which considers, in Black History month, the future of blacks. Tragically, more black men pass through the criminal justice system than through America’s college and university system. In Baltimore, for example, 52 percent of black men in their 20s are either incarcerated, on parole, or on probation. Imagine what type of city Baltimore would be if 52 percent of black males were instead college graduates or in college or graduate school? .....we are slowly approaching the possibility that there will be progress only among the black elite and the rest will be left behind, enslaved to dependency or incarceration. TVNZ is under fire from the Principal Family Court judge for unbalanced reporting following a news item which screened last weekend, which criticised the court for taking a two-month-old baby away from its mother while she was still breast feeding. Judge Peter Boshier says it was not made clear that the mother had left the child after a New Year's Eve party, to allegedly go to a hotel room with a man. He says she did not return home for several days. Judge Boshier intends to write to TVNZ to point out the newsroom did not report in accordance with The Care of Children Act. He says decisions in the Family Court are made for good reasons and parents should not be able to use the media to promote their case. Who would pay $800 to read what is fairly obvious to anybody who takes an interest in politics? "The book also claims Social Development Minister David Benson-Pope is regarded by some colleagues as a pompous prat, Education Minister Steve Maharey is not as smart as he thinks he is, and Auckland Issues Minister Judith Tizard is not the hardest worker...occasionally a bully." Rodney Hide's bill to define the principles of the Treaty of Waitangi was defeated last night. According to Stuff, Mr Hide wanted the principles to be legally defined as: That the Crown exercises sovereignty over Maori and non-Maori New Zealanders, that the Crown has a duty to uphold property rights, and that all New Zealanders have equal rights before the law. Let's be clear on this. Labour, NZ First, The Greens, United Future and the Maori Party rejected these principles. The Maori Party said it would not promote Maori interests. Doesn't that say it all. This is an excerpt from a submission written by Peter Zohrab on the Crimes (Abolition of Force as a Justification for Child Discipline) Amendment Bill. "These findings suggest that men tend to modulate their reaction to stimuli, and engage in analysis and association, whereas women tend to draw more on primary emotional reference." To put it simply, women have evolved to get emotional about things, and men have evolved to be rational. Sue Bradford's Bill is evidence that women would be better off at home, indulging their emotions on their children, leaving the men to make decisions -- e.g. about legislation -- outside the home that require rational thinking in the face of emotional stimuli. Nahmias, in Neuroreport Vol. 15 2004, pp 219-223. There is undoubtedly more than a grain truth in the assertion that females draw more on emotional reference. We see it in voting preferences. But to react emotionally is not to be irrational. There needs to be a balance. I am reminded of something I read today attributed to Stalin; "One death is a tragedy. A million deaths is a statistic." Extreme rationality is as bad as extreme emotionality. 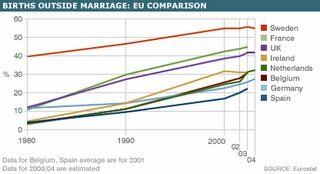 The proportion of children born outside marriage in the UK has leapt from 12 percent in 1980 to 42 percent in 2004, according to the Office for National Statistics. They haven't caught up with us yet. Our proportion in 2004 was 45 percent up from 21 percent in 1980. A Stuff poll asks whether you will be watching South Park tonight. The majority (at the moment) say,"No, I'm just not interested." An article in Newsweek explores the effects of tax and welfare sytems on women in the workplace. Here's a pop quiz on gender equality. In which part of the world are women most likely to reach the highest rungs of power? Choice A offers new moms 12 weeks of maternity leave, almost no subsidized child care, no paid paternity leave and has a notoriously hard-driving business culture. Choice B gives them five months to three years of paid time off from their jobs after having kids. Millions put their offspring into state-sponsored day-care centers for several hours a day. Government agencies, full of female directors and parliamentarians, protect workers at the expense of business and favor a kinder, gentler corporate culture. So which place is better for women who want to make it to the top? If you guessed A, the United States, you'd be right. If you chose B—Europe—think again. According to a paper published by the International Labor Organization this past June, women account for 45 percent of high-level decision makers in America, including legislators, senior officials and managers across all types of businesses. In the U.K., women hold 33 percent of those jobs. In Sweden—supposedly the very model of global gender equality—they hold 29 percent. Why is this? Simply put, Europe is killing its women with kindness—enshrined, ironically, in cushy welfare policies that were created to help them. By offering women extremely long work leaves after children, then pushing them to take the full complement via tax policies that discourage a second income, coupled with subsidies that serve to keep them at home, Europe is essentially squandering its female talent. Not only do women get off track for long periods, many simply never get back on. NZ is mistakenly headed in the European direction. Overall, Māori were twice as likely as non-Māori to smoke. Statistics from the 1996 Census indicate that 44% of the Māori population aged 15 years and over were smokers, compared to 21% of the non-Māori population (Table 1). Māori were also less likely than non-Māori to be ex-smokers. Are Maori Party voters going to be angry about the now official policy to make smoking illegal? I have one received opinion which says, no. They are only interested in what the Maori Party can achieve in respect of the Treaty and property rights. Hone Harawira can get away with it because of his mana. He'll be seen to be doing what is best for his iwi. I vehemently disagree. Otherwise I'd have to concede that Maori want to be told what to do. According to National MP, Judith Collins, Minister for Social Development and Employment, David Benson-Pope was supposed to speak at last week's international child abuse and neglect conference but was a late "withdrawal". It was surprising to see the Prime Minister address the conference. Perhaps she delivered a speech that had been prepared for Mr Benson-Pope. In it she said, "Children too need strong relationships and good self-esteem. They need to know that adults respect their rights, and that they have a voice." It is fairly obvious the sort of cannon fodder this would have delivered to the opposition if Benson-Pope had said it. Then again, given Clark's steadfast support for her Minister, perhaps the opportunity is not lost. United Future began the year with a caucus and board retreat. According to united Future MP, Gordon Copeland, this is some of what Peter Dunne said. · and we’ve reinforced our role as a solid, sensible, reliable centrist party that adds real value to any New Zealand government. The public hears our message, responds positively and we gain 10% of the party vote, leading to a United Future team in Parliament of 12 MP’s. That’s the vision; how do we get there? "During the election campaign Dunne and National Leader Don Brash publicly sat outside an Epsom café over a cup of tea as a demonstration to the electorate that Dunne could co-operate with the National Party. This demonstration saw the majority of National supporters in Ohariu-Belmont combine with United Future and other Dunne-supporters to return Peter Dunne with a comfortable majority. National comfortably won the party vote in his seat. Dunne’s decision to work with Winston Peters also counterpointed Dunne's previous comments about Peters’ reliability. In one well-publicised press release Dunne reworded one of Peters’ well-publicised campaign phrases by saying "Can we trust him? No, we can’t!" Proof of global warming. The evidence is pretty robust...or at least, it used to be. Here British Conservative Leader David Cameron pits himself against Gordon Brown, Labour's PM-in-waiting. As political speeches go, it's really not bad. "We desperately need new thinking if we're to tackle the problems of multiple deprivation. We can't keep pulling the same levers and hope for different results. We can't keep growing and growing the welfare state. We must realise that Gordon Brown's ever-growing state cannot win the war on poverty on its own. Gordon Brown says that only the state can guarantee fairness. One look at his record exposes the hollowness of his claim. If life in Calton and Drumchapel is his definition of fairness, I suggest he rethinks his guarantee." That much was demonstrated by William Galston, the liberal academic who inspired the Clinton-era welfare reforms. His genius was to relate facts and figures to real lives lived by real people in the real world. Did you marry before having children? Did you have children after 20? He found that of the people who did all three, only 8% were poor; but of those who failed to do all three, 79% were poor. ....to sketch a plan for Britain. Worth a read. The collective war against child poverty is internationally fashionable. Another assault is about to be unleashed in London. At the root of the London problem is one in three children live in a lone parent family but the ECPC (End Child Poverty Campaign) solution is, "A strong partnership between Central Government, the London Development Agency, the Greater London Authority, the Association of London Government and London boroughs is needed to devote greater resources to tackling poverty and unemployment in London." Translated; through the vast and coercive machinery of state let's throw a whole lot more money at the problem. It won't work, it has never worked. What will work is an army of self-deceiving do-gooders will experience salvational euphoria and jobs for life. In 2002, a total of 460 people died by suicide, compared with 507 in 2001 and 458 in 2000. The figure for 2003 has just been released. 515 people killed themselves. Suicide rates for Maori are higher than for non-Maori. Thirty five years ago the suicide rate for Maori was very low. Out of 237 suicides only 5 were by Maori. What happened? Business Analyst Roger Kerr suspects the reason NZers spend so much time on the internet is because it is so slow. New Zealanders are the secong highest users of internet in the world, apparently. I disagree with his suggestion. Without broadband I would get tired of waiting for information to load, found using the internet a frequently frustrating experience and consequently used it less. Is she planning any more? With in vitro assistance, a 62 year-old californian woman has just given birth to a baby boy. When he's three she'll qualify for supplemental security income. Hope she can get by until then. Ooops. She already does qualify. She has been blind since birth. Canterbury University's online services were shut down last night after a computer glitch made the private records of thousands of students available to anyone with a user code and password. Looks like the Christchurch Press were tipped off about a Canterbury University computer problem. "A Press reporter with a current student identification number yesterday logged on to the university's student web system and accessed several other students' details." Isn't this a bit like admitting to looting. Has the reporter "stolen" information just because he or she could? Does it really matter when any of the other 12,000 students could have done the same? The Varsity were very slow to shut down the system. Well, if he isn't he should be. If the taxpayer is going to bankroll the security for this week's Auckland engagement then why not a quid pro quo. Go on State telly and tell us about your greatest achievement as President of the United States. A good shot at killing off lifestyle welfare...or formally, passing the Personal Responsibility and Work Opportunity Reconciliation (PRWOR) legislation. Bring on the day when NZ actually embodies the term Personal Responsibility in a legislative Act. Went to see the movie this afternoon. I can't possibly say anything that would do it justice. The movie ends but much of the audience stays seated. Where's the rewind button? Occasionally a movie makes you feel an ache. You are missing the character like you miss a parent that's died. The music was, if anything, better than the real thing. None of it was foreshortened, leaving you unsure whether you had just been to the best concert or the best movie. It starts dark. His childhood was tough and tragic. So as his music emerges, literally dragged out of him in the Sam Phillips audition which nearly ends a career that has barely begun, you are lifted up with him. Apart from the childhood years the entire movie is focussed on the middle years. And that's how you want it. The audience attachment to the youngish Cash character is so strong it would have been a mistake to break it. Reading the Listener I came across this, "In Britain, the Blair government last year announced plans to put more onus on local councils to provide childcare..."
It's true. The Telegraph reports, A separate Child Care Bill will place a new duty on councils to offer "affordable and flexible" child care for the under-14s. Local authorities will have to offer a minimum number of places, while Ofsted will have greater powers to inspect those caring for the under-fives. Good grief. We can now see one of the ways the Local Government Can Do Anything Bill, passed here in 2003, may turn into a licence for much greater localised redistribution of income. A friend sent me a slideshow about the amazing Dubai snowpark which opened last December. This report is from the BBC. The area under snow is the equivalent of three football pitches, with runs built inside a giant, slanting metal tube around 25 floors high. All clothing and equipment is provided in the entrance price of $35, including black, knee-length padded coats for any Arabs who prefer to wear their traditional kandouras to visit the snow - but skiing in the robes will be banned. The snow is made by shooting water at high pressure into an atmosphere maintained at around freezing point by coolers both below and above the slopes. Until now Dubai has been a destination for warm beach holidays. 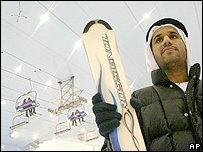 But the ski slope is likely to be most popular, especially for residents, during Dubai's harsh summer when temperatures reach well above 40C. More British households have been victims of crime than American or Canadian. And North Americans have more confidence that police would protect them from violent crime than Britons. In the UK, there has been argument about crime statistics for many years. Governments like to talk about reported crime statistics. But then a lot of crime goes unreported. Crime surveys, like these, reveal that the true level of crime is higher. It will be interesting to see what our own Crime and Safety Survey 2006 produces.